The Bioethics and Law Observatory (OBD) of the University of Barcelona is releasing a series of documents –together with of “la Caixa” Banking Foundation- on the ethical, legal and social implications of the current nutrition system. The first opinion document was presented today Monday March 28, at 18.30h, at the Faculty of Law of the University of Barcelona, and wants to highlight “the disconnection between the current policies on nutrition based on its tag and the indiscriminate diffusion of food information the consumer has”. Also, it wants to show “the consequences this situation can have on individual food choices, public health and the perpetuation of productive practises and patterns of environmental and socially unsustainable uses”. The text, entitled Food information: ethical, legal and policy issues is coordinated by the directors of the Master degree in Food, Ethics and Law of the UB, M. José Plana and Itziar de Lecuona. The creation of the document counted with the participation of several experts of the opinion group led by María Casado, director of the OBD. 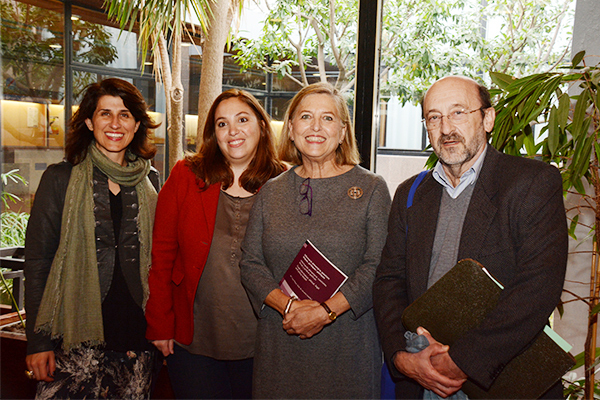 The presentation of the document counted with the participation of the mentioned coordinators and María Casado. Also, other participants were Jordi Portabella, director of the Department of Research and Knowledge of Fundación Bancaria la Caixa, and the researcher Pere Puigdomenèch, member of CSIC and the European Group of Ethics in Science and New Technologies and one of the signers of the text. The aim of this document is to “influence public policies and social debate on bioethical challenges presented by the current food system and its evolution; focusing on the role of innovation and information technologies on security, quality and effective sustainability of the system, and putting emphasis on communication and people’s risk perception”. “The aim of Obra Social “la Caixa” is to contribute in the construction of a fair society. In this context, nutrition, as one of the basic functions of life, needs a more precise and understandable information for everyone”, said Jordi Portabella. The document states that, if tags have an essential role on consumer’s protection, it is necessary to go through the public policies on food information: “It is necessary to improve legislation and act convincingly to get rid of advertising campaigns that, despite fulfilling the law, mislead consumers when it comes to food’s information”, said the coordinators. The authors suggest setting up initiatives so that citizens can be aware of the the social and environmental costs caused by certain food products, for example, on animal health as well as the environmental impact coming from the uses of certain materials or techniques in the food chain. The document puts special emphasis on online communication. The authors believe it is important to promote good practices among those who share information (bloggers, digital gateways, food-content apps) “to improve the commitment with quality and security”. At the moment, these suppliers do not have systems to give explanations to readers. In addition, the document complains about not having transparency regarding the used resources or advertising interests from content suppliers. Moreover, and “facing the overwhelming dose of information on researches that are apparently scientific, with a reliability and quality hard to verify”, the document calls for a protection of the independence of health professionals, who are the source of information on which people rely the most in these subjects. To do so it suggests setting up protocols that –like it happens in the pharmaceutical industry- can stop promotional initiatives for these professionals. The OBD Opinion Group, that created this document, was created in 1996 under the supervision of María Casado. This group aims to have an influence on the dialogue between the university and society through scientific and technological knowledge transfer and the necessary reasons to take part in an information social debate. The publication of this document reaches the twenty-five texts that already make a collection, published by Editions and Publications of the UB, covering current affairs on which there is not an unanimous opinion among society or different involved scientific communities. This required identifying problems, contrasting explanations and suggesting consensus recommendations.